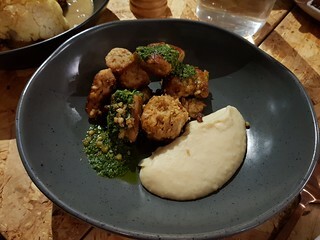 At the end of last year (yes, I am behind), I went to dinner at Grown with a bunch of Brisbane vegan Instagrammers, at the invitation of my friend Tracee. Grown is a charming vegan cafe, that at the time had only recently started offering a dinner service. Six months on and their dinner service is still going strong, as well as their morning opening hours. Tracee and I decided to share a few things, so that we could maximise out eating options. 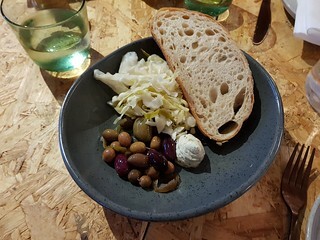 We started with a couple of small plates - The Olive, Sauerkraut, and Sesame Cheese, as well as the Baba Ganoush. 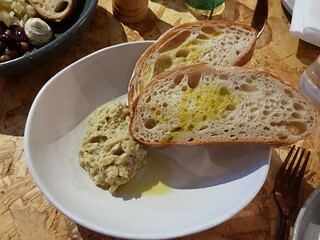 Both came with slices of delicious house-made bread. 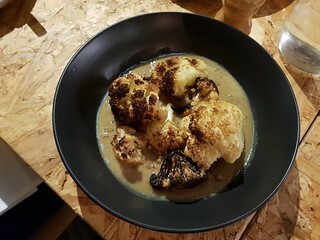 For larger plates, we shared the Roasted Cauliflower with Lentil & Cerveza Soup and Cripsy Buckwheat, and the Smokey Mash with Tempeh and Herb Sauce. I had no idea what cerveza was until I googled it, it means beer. They were both delicious, but the cauliflower was the stand out. 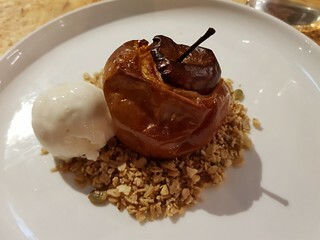 For dessert, I had the Baked Pink Lady Apple with Granola and Vanilla Ice Cream. Their housemade ice cream is coconut, but they have some good old So Good Vanilla as well, so they subbed that in for me to make sure I didn't have any coconut fat issues. This dessert may look and sound simple, but it was delicious. Like a perfect apple crumble. It was a really lovely dinner, and I am looking forward to visiting again for both brunch and dinner. The menu in the cafe has changed since I was there, though they have not update their website or Facebook page with the current menu. But I'd love to see what they do in winter! They are also very good with gluten free people. One of our party was a coeliac, and they new exactly what was GF, what might have cross-contamination, and any subs that could be made. Overall, highly recommend! 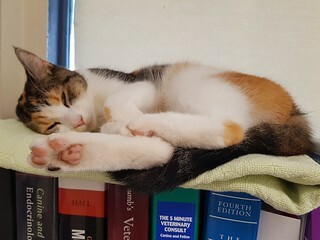 Our adoption kitty Penny sleepsies and shows her feetsies! More Quick-Fix Vegan is the third book in Robin Robertson's 'Quick-Fix; Series, cookbooks that will have food on the table in thirty minutes or less. You can see what else I have made from this book here. 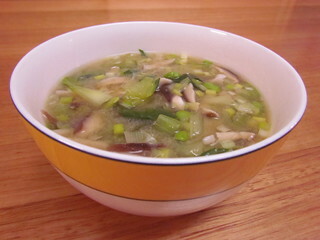 Clear Shiitake Soup with Bok Choy and Edamame: A comforting miso soup, full of mushrooms and greens. I halved the recipe, though I needed to add slightly more broth to cover it all. Tempeh Larb: Part of the 'Bowls' chapter, I halved this recipe and made one big serve for myself. 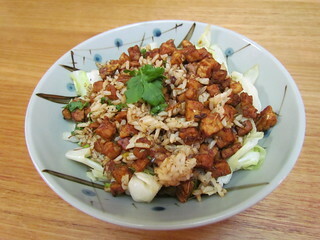 The tempeh and rice are seasoned and fried, and tops a bed of green cabbage. Because raw cabbage can sometimes upset my stomach, I lightly sauteed it first. Chickpeas Nicoise: I really enjoy the Nocoise combination of flavours, and am always keen to try any recipe that has them. 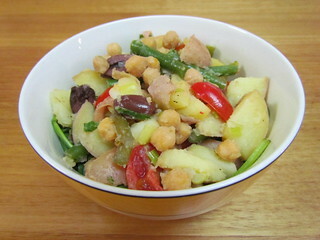 In this one chickpeas, tomatoes, and olives are sauteed with steamed potato and green beans. I made a full recipe, but only got 2.5 serves rather than 4. Also nice with a bit of nutritional yeast sprinkled on. 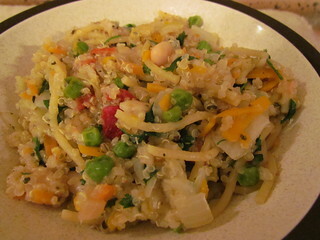 Quinoa-Roni Pilaf: Beans, spaghetti, and squinoa form the basis of this, though I also added some wombok, peas, and carrots to up the vegetable content. It took me a little longer to cook the quinoa and spaghetti through than the recipe stated. It was an interesting combination, lots of fun topped with some ketchup and nutritional yeast. Quinoa with Fennel and Black Olives: The fennel and quinoa and simmered together, giving a lovely flavour the whole dish. As well as olives, tomato, basil, lemon, and white beans are added. I served this over some baby spinach (though it would also be great sauteed through during the cooking), and sprinkled with some nutritional yeast. 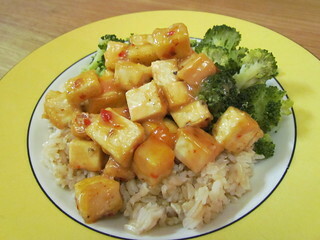 Big Bang Tofu: This recipe sounds a bit weird, with the sauce a mix of mayo, sweet chili sauce, and sriracha. I made this quite a while ago, before my chili intolerance really kicked off, though I still used a very mild sweet chili sauce. Even though it seemed weird, it tasted OK! The mayo I had on hand at the time was the Melrose brand, which is a bit mustardy (these days my favourite Vegenaise is available in supermarkets). I used a 500g block of todu, and served it with brown rice and broccoli. 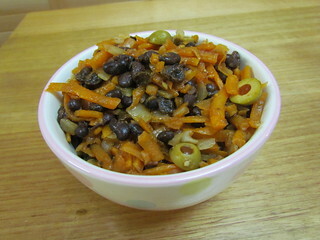 Black Bean and Sweet Potato Picadillo: I like picadillos, the nice combination of sweet (raisins) and salty (olives). The recipe called for one sweet potato, and mine was a large 800g one. But I used it all, and left out the capsicum. I also added some extra olives. 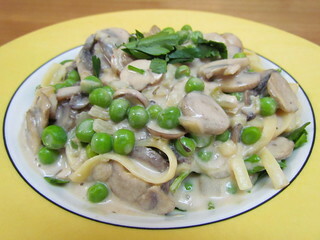 Stroganoff-Inspired Pasta: This recipe was on the meh end of the scale, it was a bit bland, and also it was a bit too saucy. I would consider doubling the amount of tomato paste and decreasing the amount of nondairy milk if I was making it again. And before you ask, I know I have a habit of halving the amount of pasta that US recipes call for, but this one started out with 8oz pasta, and that is what I used. Also, while it is less than 30 minutes, there are quite a few pots involved, so factor that in for washing up. I added some peas and served it over baby spinach. Jamaican Rasta Past: Unfortunately this was another bit of a meh, also falling into the bland camp. Though to be fair I did leave out the chili, so perhaps that is where the flavour burst comes from. 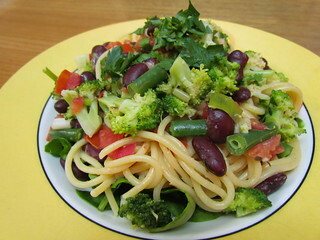 I used a combination of broccoli and green beans, and also added a tin of kidney beans. Linguine with White Clam-ish Sauce: Hmmm... the pasta recipes aren't doing to well in this round up. This definitely had nice flavours, but was quite dry. 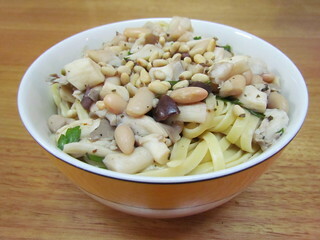 I decreased the amount of pasta, but also added some white beans and extra mushrooms. They use oyster mushrooms as the 'clam' stand in. I only got three serves from this. 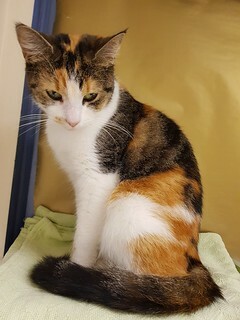 Meet Penny, our current adoption kitty! She is about nine months old, and is just lovely. For the most part it doesn't take me too long to get around Brisbane, but there is something nice about options closer to home. 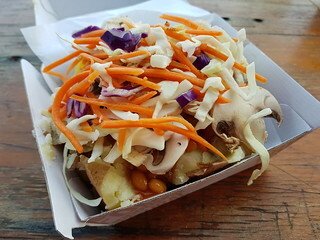 The Mt Gravatt Marketta is a weekly food market that is not too far from where I live, and has quite a few vegan options. I have only been once, and it was at the end of last year (I am so far behind in my posts, but catching up! ), so the options may well have changed since then. In fact, I know they have because my mum sends me every vegan mention that the post about! I think it does vary from week to week, but you will definitely find something. Here is what I found! 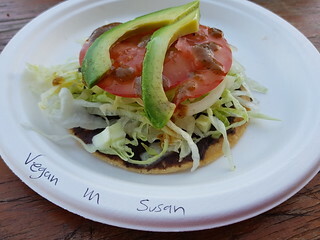 Starting with this Vegan Tostada from Viva la Tostada. It is the vegetarian tostada minus the dairy, but of course the price is the same. Black beans and crunchy veggies and avocado, it was nice, though a little dry. I can't remember the name of this stall, but it had lots of bubble teas! 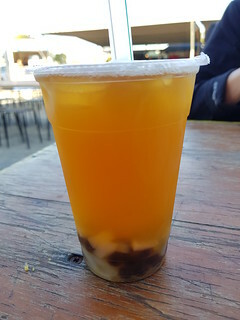 I had a Peach Iced Tea with Pearls and Lychee jelly, and it was yum! Could I be more vegan getting a falafel plate? But this one from Yossi's Falafel was excellent. 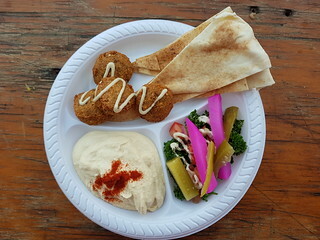 The falafels were perfect texture and flavour, with some pita bread, pickled vegetables (I love pickles! ), and super creamy hummus. Yum! 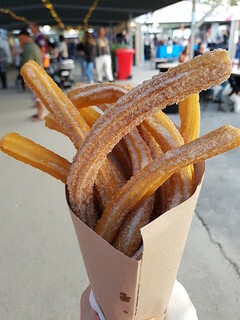 Confession - I have never had churros. Well, except for the fancy ones from Terre a Terre in Brighton, but they are really in a category of their own. Barcelona Churros had vegan churros, though no vegan dipping sauce. They don't have any sort of small serve, so I did my best to get through this giant cone. I couldn't finish. Initially they were delicious, hot, crunchy, cinnamon sugary. But they cooled quickly and were not as good, and I was getting full. I needed someone to share with! But not too full for ice cream! 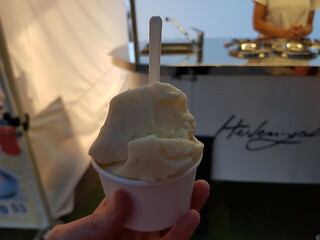 Heavenya was a small gelato stall, with two vegan flavours with the rest of their offerings. I picked the pineapple sorbetto over the coconut based chocolate, and it was refreshing and creamy and delicious. A perfect end. Some other options I saw included a vegan burger, and a vegan Laksa. I had messaged a number of stalls before going to confirm vegan options, but it seems like these days there is always something. As I mentioned, this visit was several months ago, so attending stalls or menu items may have changed. But if you are looking for something fun to do on a Saturday evening on the south side of Brisbane, this is probably worth a visit. It is winter here, so the sun is much slower to come up. Dim Sim takes this as a personal affront, but is pretty good at seeking it out where she can. 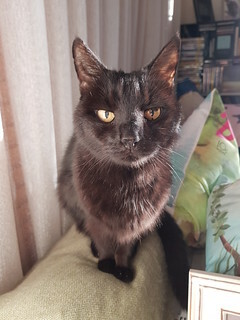 She is perched on the back of a sofa here, and you can just see the sunlight on her fur. 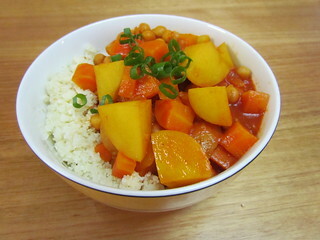 Carrot, Potato & Chickpea Red Curry with Cauliflower Rice: This is a hearty, comforting curry. The recipe calls for a quarter cup of red curry paste, plus more to taste. So cute. I used a tablespoon and got a nice mild heat. Because there is no coconut milk in this curry to mellow out the heat a bit (it is a tomato based curry rather than a creamy one), I increased the amount of sugar to use two of the larger Australian TBS (20mL each), rather than the standard US one (15 mL each), and also added a squirt of lime juice. I got a lovely sweet, tasty curry with just a very mild heat. I served this over cauliflower rice, which was just cauliflower processed up and sauteed in a little oil. Cauliflower rice will in no way replace real rice for me, but as there was a lot of potato in the curry for carbs already, it seemed like a fun thing to try. I think this was my first cauliflower rice! Crispy Baked Tofu: This recipe is so simple and so easy and barely a recipe, basically just involving baking plain tofu cubes until they are crispy. But sometimes the simplest things are the most perfect. And I do really love tofu. I made this for another recipe, but I also just snacked on a bunch as well. 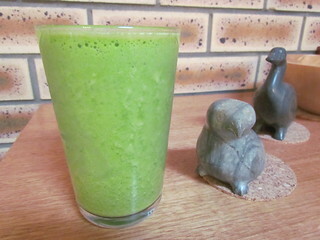 Super Green Juice: I don't have a juicer, but this is a blender juice. It has parsley, coriander, spinach, kale, celery, ginger, cucumber, apple, lemon and either banana or pineapple (I used pineapple), that is blended up with water and strained. I am a rebel, so I had mine as a smoothie rather than a juice, because sometimes I am too lazy to strain. It was post sweaty yoga, so I used coconut water instead of regular water. It makes a lot of juice/smoothie! It was... OK. Not my favourite mix of greens. The texture was also a bit strange, though that is my fault for making it as a smoothie rather than juice. But the flavour was just not quite there for me. Beet & Green Apple Yogurt Smoothie: So pretty and pink! Also very refreshing. 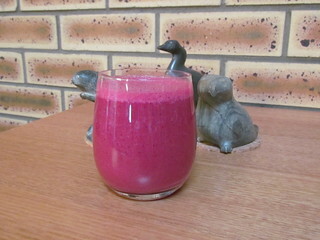 This uses raw beet, a green apple, and vanilla soy or coconut yogurt, I obviously went for soy. It has berries in it as well as the beet and apple, and some lime for tartness. A great mix of earthy beet, sweet apple and berries, and the lime. 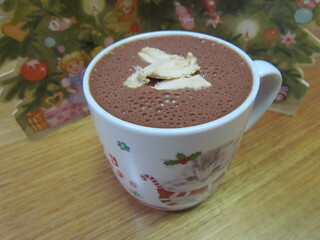 Super Powered Chocolate Shake: I know this looks more like hot chocolate than a shake. I styled this for a MiniMoFo challenge about warming up over Christmas. Of course, in Australia, Christmas is hot! So even though it is in a mug, that is one icy cold smoothie and the marshmallows are actually ice cream. I made a few changes to this simple recipe. I used peanut butter instead of almond butter (almond butter is just so expensive here, plus chocolate and peanut butter is a perfect match), oat milk instead of almond milk, and LSA mix (linseed/sunflouwer/almond meal) instead of flaxseeds (aka linseeds). The cacao powder, chia seeds, and banana I had as written. I also left out the date, because I knew this would be sweet enough for me without it. 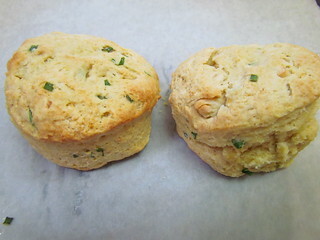 Garlic Cheddar Herb Biscuits: I haven't made a lot of biscuits, but these are the best I have ever made. They are salty, garlicky, cheesy, and delicious! I made a half recipe and for 4 biscuits using a 2.5 inch cutter. 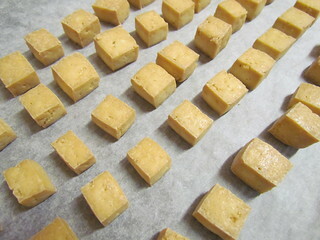 The cheddar flavour comes from lots of nutritional yeast. I loved these. Chickpea Fesenjan: I wasn't sure exactly what this would taste like before I made it, but it was a runaway hit. 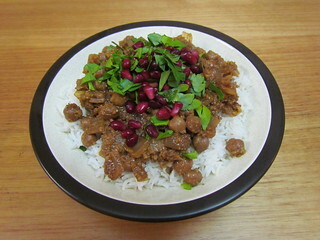 Roasted walnut meal is mixed into a sauce with pomegranate molasses and simmered with chickpeas. I am not always the biggest fan of walnuts, sometimes they can be bitter, but after the simmering there were no issues. The sauce had such a great flavour, including some lovely sweet onions as well. I served this over basmati rice, and we got 3.5 serves from it. The recipe calls for 1.5 cups, or 180g, of walnuts. My 1.5 cups was less than 180g. 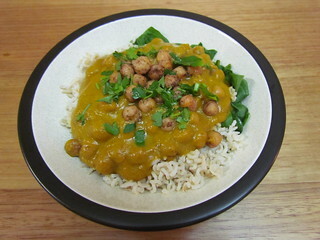 Masala Chickpea Curry: This comes together easily, and is a very lovely sauce. The recipe calls for 4TBS of garam masala, which seems like a lot. She does have a note to make a quite GM blend, though I used my regular store-bought one. My one was nothing like her one, and I decreased the amount to 4 tsps. It was quite peppery! As well as simmering chickpeas in the sauce, it is topped with some spiced chickpeas as well. I reheated these garnish chickpeas just before I put them on. I served this with rice and baby spinach, garnished with parsley and with a little lime juice squeezed on. It says it makes 4 serves, but really it is 3. 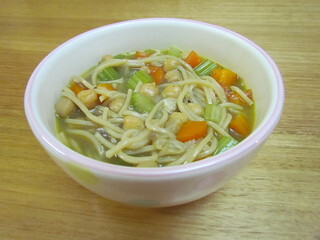 1-Pot Chickpea Noodle Soup: I scaled this recipe for six down to a recipe for one, when I was under the weather and needed something soothing. I used 1 carrot (instead of 5), 2 celery sticks *instead of 4), 2.5 cups of stock (instead of 7-8 cups), and a 70g bundle of ramen (instead of 225g of spaghetti). After simmering for 10 minutes, a lot of the liquid had absorbed. It made one big serve, for one not so well girl. And it definitely hit the spot. 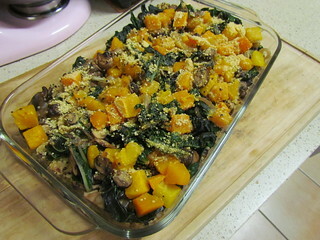 Butternut Squash, Kale & Quinoa Bake: I had to use silverbeet (swiss chard) for this recipe because the kale in the store was no good. As well as butternut a kale, this also has onions and mushrooms. 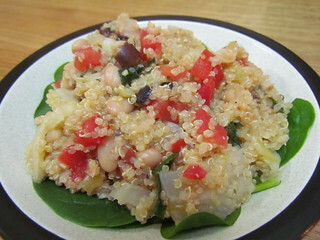 I could have decreased the dried quinoa from 3/4 cup to half a cup, as I would have preferred a heavier vegetable ratio. I got three to 3.5 servings out of this. I used a shallow rectangular baking dish, rather than an 8x8 inch one, and it was the perfect size. I served this over some more silverbeet. 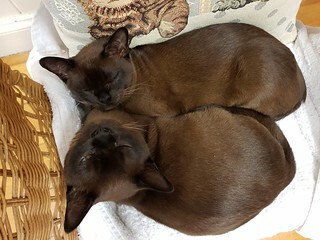 Look at these two ridiculous Burmese brothers. They love snuggling! 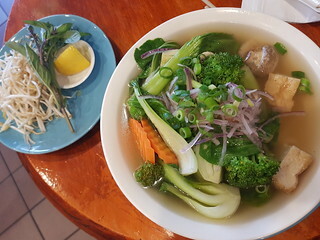 One of West End's many offerings, EatMii is a Vietnamese and brunch cafe that has several vegan options. While they do offer some more 'traditional Australian' breakfast options, all I ever see people order here is the Vietnamese food, with good reason. It is delicious. They have several vegan options on the menu, and I have tried all but one. For research, of course. The one I didn't try is a spicy noodle dish, so I must leave that research to someone braver. 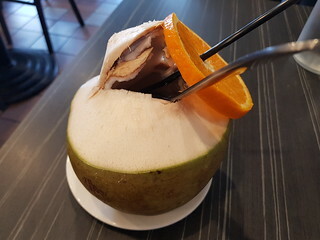 If you need a refreshing beverage, you can get a coconut in the shell. I always forget how awkward I am with these. But they are fun every now and then. Of course, pho is one of the first things that comes to mind when I think of Vietnamese food. Their vegan version is a steaming hot bowl of fragrant broth, full of tofu, mushrooms, herbs, and vegetables. 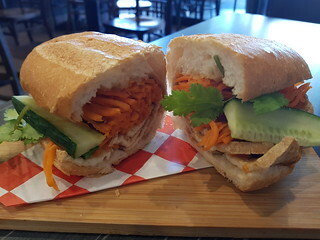 The also offer a Tofu Banh Mi, which can be made vegan. They don't replace the pate or mayo with anything, so it isn't quite as fun as it could be, but it is still a very satisfying sandwich. 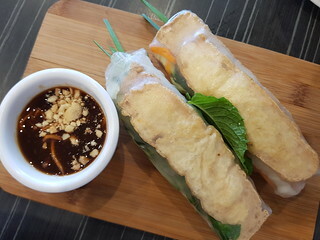 Rice paper rolls are a refreshing snack or starter. Their vegan ones are filled with tofu and crunchy vegetables. I got mine with the hoisin and peanut sauce, because why would you not choose that. But my pick of the bunch is the Vegan Tofu Bun. 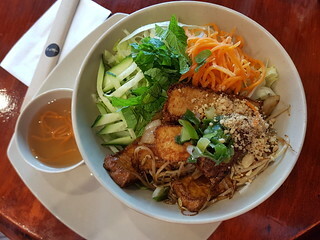 A delicious vermicelli salad with crunchy noodles and tofu. And the tofu is to die for. It is so delicious, I wish I could just order a bowl of that tofu alone. Now that I have been through all the non-spicy vegan menu options, this is what I will be ordering at any future visits. So good! Sitting on clothes was always Sahara's thing. 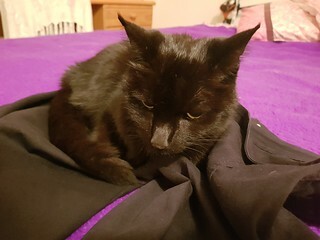 But the other day I came up to find that Dim Sim had unexpectedly taken a liking to these black pants. In fact, the light was off when I came looking for her and I couldn't see her until I turned it on! Camouflage kitty. At least her fur will match the pants, Sahara left red fur all over things, and Gizmo was tabby, so you could always see where they had been sitting!